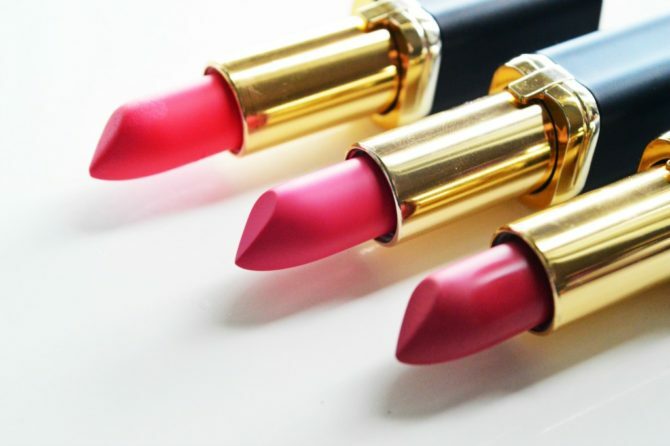 I was WAY excited to get my hands on three lipsticks from the Colour Riche Delicate Rose Collection from L’Oréal. First off, the packaging. It just looks and feels super luxe. The black and gold is the perfect colour combo, the ‘L’Oréal’ embossed across the bullet is super sleek, and the golden celebrity signature at the front of the bullet is the perfect touch to a celeb range. You can find the range and shade names at the bottom of the tube. At the top there is a golden ‘R’ for Riche. This shade is Blake Lively in a tube. Seriously! It is a bright, fun, popping pink with a slight orange tinge. Originally I thought this would be the perfect shade for a blonde or fair complexioned person but the more I wore it I started seeing the kind of maroon or even blue-ish undertone. Therefore it can suit darker complexions too. I definitely thought it worked well with my hazel coloured eyes and made them look greener. This shade is a very wearable one of the range. Deeper than Eva’s but not quite as bright and poppy as Blake’s, it feels and looks the most matte to me (even though they are all from the same range) but that may be because this one contains absolutely no shimmer whilst the other two contain slight shimmer. 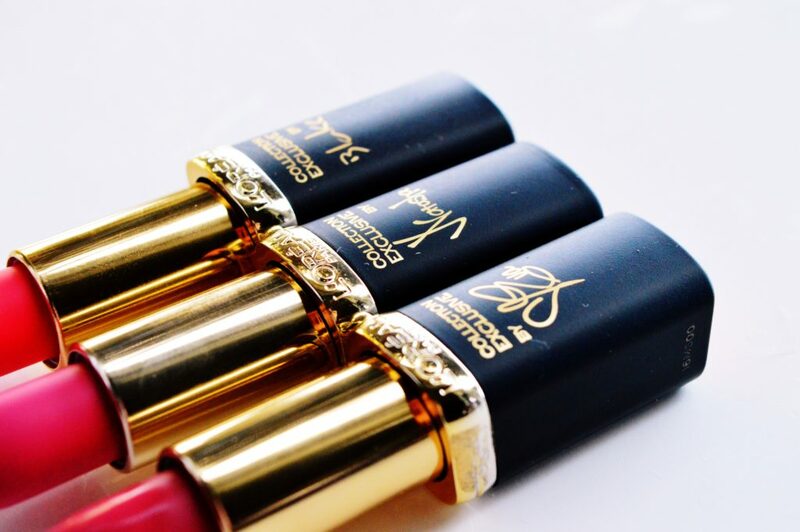 It is also the most buildable shade of the three, meaning you can achieve different lip options with just one tube. Miss Longoria’s shade is definitely right up my alley. Out of the three shades, this one is the least opaque, yet it is my favourite. It is the perfect day time and night time appropriate shade. You can wear it with heavy make-up and with really simple make-up. Either way the dusty mauve shade compliments most looks. It is definitely the choice to always keep i n your handbag in case of emergencies. It also contains the slightest glimmer of shimmer in it. 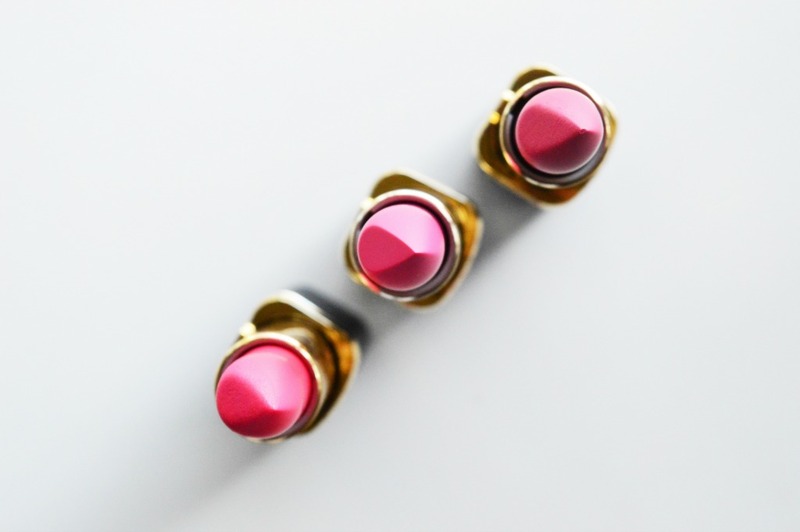 All three of the shades look slighty more opaque in their bullets than what they pay off as on your lips. They apply smoothly and velvety with a matte finish, but an extra coat or two won’t go amiss. This would be why the range is the Colour Riche Delicate Rose Collection range. If you are wanting a bolder and brighter look, all you need to do is pair the lipstick with a lipliner. Apply the liner around your lip line, fill in your lips and apply the lipstick on top. The shade pay off is much deeper and bolder and consequently will last even longer than usual. Finally, I really enjoyed these lipsticks. I would want the entire collection just to have them displayed on my vanity as they are seriously gorgeous! I definitely have my eye on the nudes in the Colour Riche Collection now. 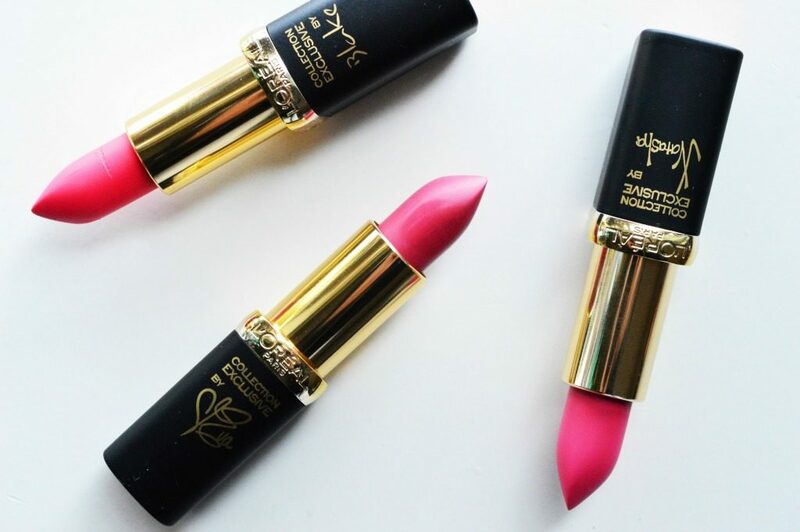 If you have any requests for reviews on other L’Oréal products or lipstick ranges, leave it in the comments!